We Have Reviewed The Latest Barbie Dreamhouse – Say HELLO! The latest Barbie house creation is the Barbie Hello Dreamhouse and this is possibly the most technologically-advanced dollhouse currently available on the market. This high-tech toy is perfect for any child who is a fan of Barbie and who also loves gadgets. However, its appearance retains the fun and attractive elements of a classic Barbie dollhouse. So, at first glance, it appears much the same in design as many of the other Barbie Dreamhouses. It has six rooms over two levels and Barbie pink features highly in the décor of the Barbie house. 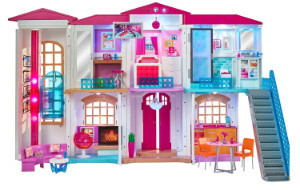 There are so many customizable options with this dollhouse that children can hours of fun simply customizing the Barbie house before they even begin to create real-life scenarios with their dolls. The entire play experience is completely interactive and adds an exciting element for children when playing with their dollhouse. The dimensions of the Barbie Hello Dreamhouse are 17 x 49.4 x 35 inches. There are two main complaints about this product; its size and the price. In terms of the size issue, the dimensions of the product are clearly stated on the product packaging and on the sites of online retailers selling this product. By checking the dimensions of the product before making a purchase, you can make sure you have the space to fit the dollhouse. In relation to the price, yes, it is expensive. However, when you consider the number of additional features that this Barbie Dreamhouse has, it makes the cost worthwhile. If you are looking for an affordable dollhouse that you can use with Barbies, we offer a couple of options here that are large enough for Barbies. It is so much more than a simple dollhouse with which a child can play with their Barbie dolls. According to customer reviews, this is the best Barbie house available right now and the predominant reason for this is the addition of technological features. 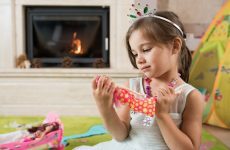 There are no other dollhouses on the market that can compete with this level of technology and the extent to which children can customize their play experience. Finally, unlike many other dollhouses, the Barbie Hello Dreamhouse is reportedly sturdy, well-made and will withstand the constant use by children, even if they are rough in their play. This is another reason why it seems worthwhile to pay such a high price for a dollhouse. Click here to see more Barbie Dreamhouse reviews.